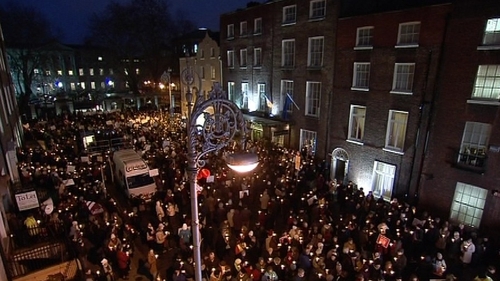 Several thousand people held a vigil outside Leinster House this evening to call on Fine Gael to keep the "pro-life promise" that was made before the 2011 General Election. The Pro Life Campaign group said the vigil was meant to send a unified message to the Government about protecting women in pregnancy and ensuring a duty of care to preserve the life of the unborn. Supporters held a large banner that reads "Enda, Keep Your Pro-Life Promise". The Pro Life Campaign's legal advisor Caroline Simons said "the way in which the debate is being stage managed and railroaded through the Dáil is deeply disturbing and undemocratic". In a statement, she said that "women deserve better than this. So do unborn babies". She said the vigil sent a clear message to those in Government who sought to legalise abortion that "there was nothing liberal or compassionate about abortion" and that "any reassurance that legislation for abortion will be restrictive is false". Niamh Uí Bhriain of the Life Institute, which was also involved in the vigil, said there would be "political consequences" if Fine Gael moved to legalise abortion. In the Dáil this evening, the Minister for Health restated the Government's commitment to bringing legal clarity to the issue of lawful abortion in Ireland, which he said did not mean abortion on demand. James Reilly also reiterated that a Government decision on what option to choose would be made before the Christmas break. There was cross-party agreement that clarity must be brought to the situation. However, United Left Alliance TD Clare Daly said the Government should act now. Five Catholic bishops represented the hierarchy at the vigil. The delegation, led by Archbishop of Tuam Dr Michael Neary, cut short their first day at the winter meeting of the Bishops' Conference to travel to Dublin from Maynooth. A spokesman said they were very impressed by both the turnout and organization of the vigil which they described as "very worthwhile". The Bishops came from all four ecclesiastical provinces: Bishops Kieran and Leo O'Reilly of Killaloe and Kilmore, respectively; Bishop Philip Boyce of Raphoe and Bishop Seamus Freeman of Ossory. They were accompanied by the Apostolic Administrator of Derry, Monsignor Eamon Martin. The spokesman said today's business at the two-day meeting of the hierarchy was dominated by discussion of their response to the Report of the Expert Group on abortion which was published a week ago today. He said they hoped to complete the text of their response tomorrow. Meanwhile, the Knights of Saint Columbanus has accused pro-abortion advocates of moving with "unseemly haste" to use the deaths of Savita Halappanavar and her unborn child to further their demands. In a statement, the Order criticizes them for "reigniting" their campaign before full details of the case are uncovered by a HSE-appointed inquiry. It urged legislators not to act precipitously in the face of what they call "a vociferous and determined campaign by abortion proponents". The Knights said current medical practice in Ireland does not constrain medical professionals from affording all appropriate treatment to pregnant women without recourse to abortion.